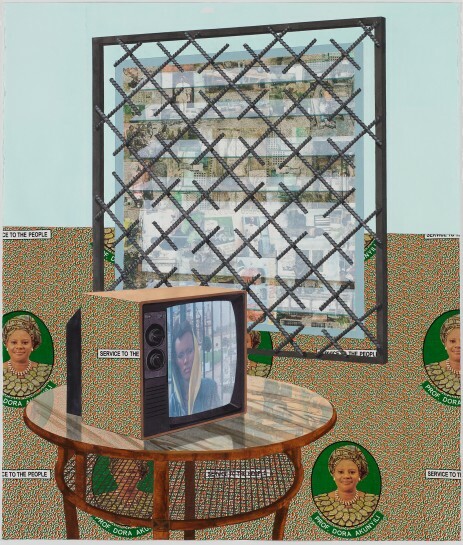 In her essay ‘Arts of the Contact Zone’ (1991), Mary Louise Pratt identified ‘social spaces where cultures meet, clash and grapple with each other.’ Njideka Akunyili Crosby encountered the concept while studying at Yale University School of Art, and it has since become an underlying focus of her practice. The artist left Nigeria in 1999, at the age of 16, to study in the United States, where she now lives with her American husband in Los Angeles. Her autobiography is a complex series of contact zones – personal, cultural and political – played out through her compositions. Akunyili Crosby’s current show at Victoria Miro shares its title with a recent work, Portals (2016), now in the collection of the Whitney Museum of American Art. The artist’s paintings are filled with portals – doors, windows, frames, screens – that exist as openings between two spaces, or as contact zones. The concept is also realised in the formal aspects of Akunyili Crosby’s compositions, which are a dense combination of painting, drawing and photo-transfer techniques. The artist brings together two cultures, her ‘Americanness’ and ‘Nigerianness’, producing large-scale works of everyday domestic and social scenes that feature her family, her husband and herself. My first encounter of Akunyili Crosby was during a talk at Tate Modern, the night before the preview of her show at Victoria Miro. She spoke about her work with a catching enthusiasm, confidently guiding her audience through the many layers of her work projected onto the screen behind her. She flicked back and forth between works, drawing attention to their thematic links. No individual piece, I came to realise, can be considered as separate from the others, but is rather a continuation of a story. That story, which unravelled during my interview with Akunyili Crosby, is beautifully multifaceted and resists confinement, forever coming into contact with other spaces. — You talk about your work in very playful terms – as a game, a puzzle, as like playing WHERE’S WALDO. Could you elaborate on this playful element to your work? — I think it has its origin in the composition stage, when I’m putting the work together. Each work takes months and it’s hard to not mentally check out. So for me to be engaged the whole time – because if you’re not engaged in your work it shows – I have to set hurdles for myself. That’s where the game aspect of it comes in. I need to have a challenge that I’m trying to figure out or get past. Sometimes the challenge can be as simple as using colours that wouldn’t usually go together. I saw this orange colour the other day and I thought it was hideous, there’s no way that anyone can work with that colour, but I want to try and work with it anyway. I’m excited about ‘Portals’ because you can see multiple pieces together. My work is all connected, and usually each work continues a conversation from another piece. When they’re all together like this, you can really begin to put those conversations together. This ties in with the way that I want the viewer to engage with the work. For example, if you spend five minutes with Thriving, Garden (2016), different layers begin to reveal themselves. If you spend an hour with it, even more elements will reveal themselves. I think that those morsels, like Hansel and Gretel’s breadcrumbs, are fun and really add another element to the work. It becomes something that isn’t easy to dismiss, because it unravels so slowly.